Scientists today recognize three distinct and separate areas of the brain. Known as the triune brain, each area corresponds to a unique responsibility or processing capability. The reptilian brain, found at the base or center of the brain, controls our basic survival activities: hunger, thirst, temperature control, hormones, approach, avoidance, heart rate, reproduction, etc. It is often characterized as the part of the brain that controls our fight or flight activities. Animals such as dogs and cats demonstrate emotions such as anger, fear, maternal love, social bonding and jealousy. Our limbic system, or mammal brain, is similar to the brains of dogs and cats. 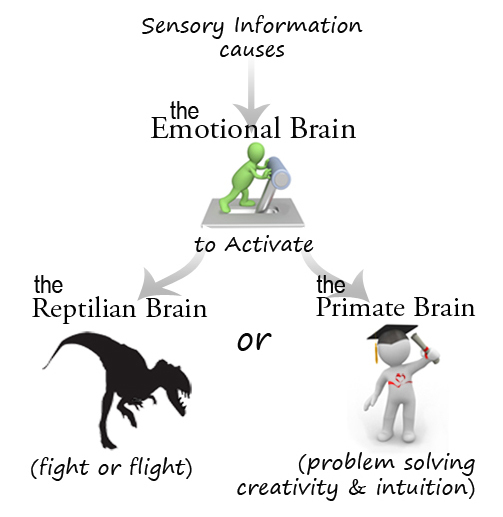 The limbic system, also known as the emotional brain, is wrapped around the reptilian brain. Lastly, wrapped around the emotional brain, the neocortex or primate brain controls our foresight abilities: problem solving, self-reflection, self-awareness, advanced planning and ability to choose appropriate behavior, etc. Characterized as our foresight abilities, the human primate brain is much larger than the cortexes of other primates such as monkeys or chimpanzees. 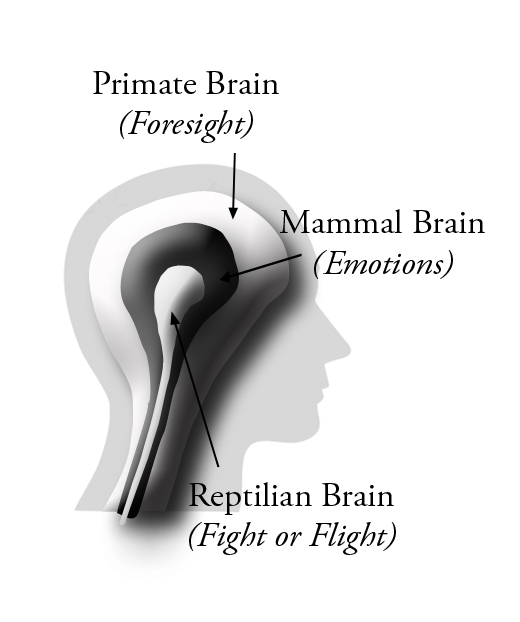 New research shows that whereas our reptilian brain controls our fight or flight activities and our primate brain controls our foresight abilities, the emotional brain acts as a switch, directing our energy to the reptilian brain or to the primate brain. The transmission in an automobile allows the energy from the engine to move the car in either a forward direction or a reverse direction—depending on whether we have placed the gearshift in forward or reverse. Likewise, the emotional brain directs our brain energy to be applied in either its fight or flight regions or its foresight regions. We can easily control our emotional brain to shift our energy forward into our foresight regions or backwards into our fight or flight activities and it happens in less than half of a second. The average person’s fight or flight reptilian brain consumes 65% of the brain’s total energy. When we learn to shift our brain’s energy away from the fight or flight reptilian brain and to our foresight primate brain, we enhance and heighten our problem solving, creative, decision making, and intuitive abilities. How could we fail to be more successful in our lives if we transition out of our fight or flight areas of the brain and into our foresight areas of the brain? 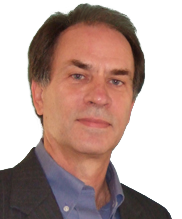 We can now see how critical emotional intelligence is to success. Our emotional center controls and directs our actions. It directs our energy to exercise either our foresight capabilities or our fight or flight activities. Since we spend the majority of our time and energy dwelling in our fight or flight systems, it only makes sense that if we learn how to shift our energy to our foresight systems, we increase our odds of success. The key lies in finding out how we can gain more control over the switch (the emotional brain) that directs our energy. 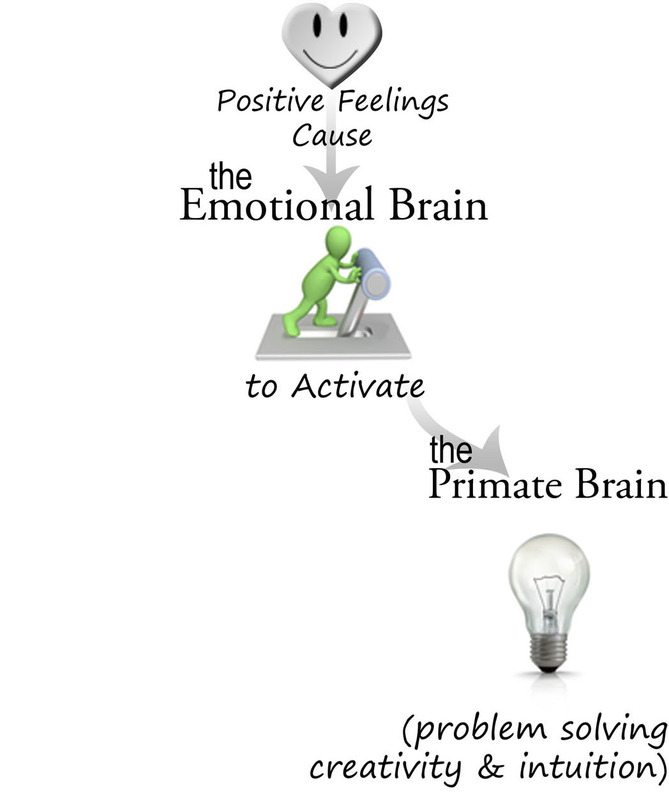 Positive feelings, causes the emotional brain to activate energy and activity in our primate brain; thereby increasing our problem solving, creativity, decision making, etc. 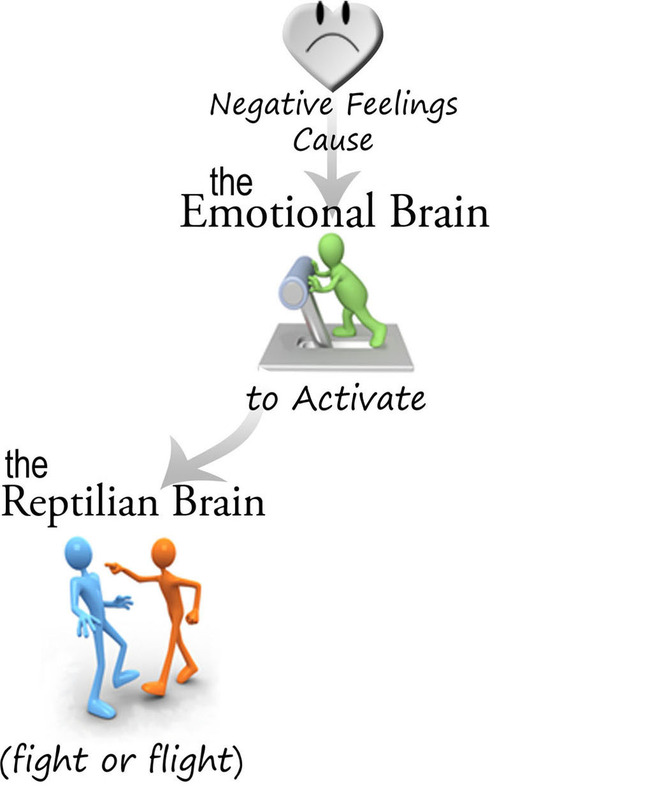 Negative feelings, however, causes the emotional brain to activate energy and activity in our reptilian brain; thereby reducing our problem solving, creativity, decision making, etc. How do we gain control of our Emotions? We are not trying to control our emotions. Rather, we are trying to become aware of them in their early stages. That way we can proactively manage them before they reach more intense stages where we damage others and relationships. For many years, scientists believed that the information we perceived from our five senses went first to the cerebral cortex in the primate brain for analysis before the information was sent to the emotional brain for emotional evaluation. However, neuroscientists have discovered that this scientific theory is incorrect. In reality, our sensory input goes to the emotional brain first where an emotional response takes place before the information reaches the cerebral cortex in the primate brain for rational decision-making. In other words, our emotional responses occur before we have time to think about them. Self-awareness of our emotions as they are happening is a critical aspect of Emotional Intelligence. How is it possible to be aware of our emotions as they are happening if our thinking brain doesn't receive the information until after an emotional response has happened? Fortunately, and unbeknown to most managers in Corporate America, our behavioral psychologies have already solved how to program our limbic system (our emotional brain). It is the key to our ability to proactively shift energy to our primate brain and away from our reptilian brain. 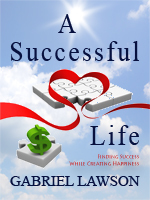 It is also the key to what is needed to successfully create good behaviors and break bad behaviors.